One of the most common quail, yet a complex one is the Coturnix Quail, also known as the Japanese Coturnix. This quail is the most valuable for its meat and eggs, but also is popular in the pet market as one that is raised when chickens are not allowed. With its fast reproductive rate, and turn over, the Coturnix is a wonderful solution for the backyard owner, the self-sufficient type, and the homesteader. Quail in general do not go by breeds. In fact, they are referred in regards to their species. For example, the Coturnix is actually referred to Coturnix japonica, but the most common names are Coturnix and Japanese Quail. Both names refer to the same species. Although the Coturnix quail makes a wonderful “alternative” bird to raise other than the chicken, please check your state laws prior to obtaining them. Some states have added in the Japanese Quail in their poultry section, even though the species is a game bird. Other states have listed Coturnix in the pet bird category. There are fish and game websites attached to each state. Always, check to see where the bird is placed, prior to purchasing. If you are interested in starting with grown birds, the best way to get them is from a reputable source that is NPIP and game farm licensed (if that is what the state requires). The reasoning behind this is that when one is NPIP tested, or licensed, they are constantly maintaining the birds, keeping housing clean, and giving better care overall, since the birds will be judged by another party for their health and welfare. This shows that you care about your flock as well and want the best. Knowing your breeder creates responsibility as you will be able to learn tips and tricks on how to care your flock. Another way to obtain your birds are from auctions and flea markets, however there is more of a risk. You do not know where the bird has been and diseases can be more likely, especially since auctions sell everything, not just quail. It is important to quarantine all birds obtained prior to placing them in their housing. If you have other livestock or birds, keeping the new arrivals as far away as possible is best for at least 30 days. This ensures you that the new arrivals are not sick. It is impossible to tell if they are carrying any ailments but practicing basic husbandry will help. Washing your hands before handling and wearing different clothes in between the new comers and old will help any bacteria or virus spread at minimal. Biosecurity plays a huge role here as well. If you have chickens or ducks, practicing biosecurity will help your quail in the long run. Make sure to keep everything clean and try to avoid visitors at all costs. Visitors, especially coming from another farm, feed store, auction, can transmit unwanted diseases to your flock. Coturnix come in about 33 varieties, if not more. Varieties is a simple term for color mutations. As mentioned before, Coturnix do not have breeds, rather species and then a color mutation. The Japanese Quail has many colors that make them extra special. These basic colors can produce much more, including the jumbo strains, tuxedo patterns, and much more! The best way to obtain Coturnix is by purchasing some hatching eggs. Coturnix are exponential too, meaning that your flock size can increase very fast if you let it. You can start with your own birds, and hatch out the eggs, making the bird quite profitable. Hatching eggs is an art, and practice makes perfect. Purchasing eggs can be a problem though. You will need to find a reputable breeder for eggs, preferable one that is NPIP tested. Many states require NPIP especially when shipping eggs. You can find your eggs local or online. Hatch rates do decrease with shipped eggs but it is a fun way to start incubating. Ebay and online auction sites are a great way to see what is out there. Start with inexpensive eggs to practice. Once you have mastered hatching and you are interested in getting better quail, then go for it! It gets addicting. Incubating and hatching is a skill and it does take practice. If you can hatch quail, you can practically hatch anything. Quail can be complex. They require a good working incubator with ventilation. I use a cabinet incubator, but started with the Hovabator genesis. The Styrofoam incubators work wonders if placed in an environmentally controlled room. If the room is nice and cool, there is less temperature spikes. 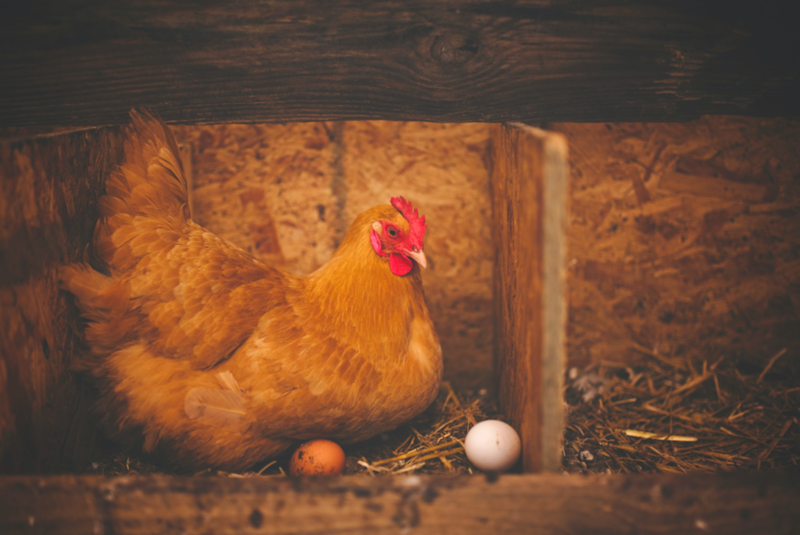 If the incubator is placed in a warmer room, the incubator could harm the eggs by overheating them. Coturnix eggs have an incubation time of 17 days. Humidity level at 50-60%, keep that humidity constant. This is different in many regions, practice and see what humidity works for you. Tip! Day one is not the day you set, but 24 hours after that egg is set. If you set your eggs on April 1st. Day one is the same time on April 2nd. It is wise to move your Coturnix eggs into the hatcher on day 14. I like to hatch right side up in the trays, however another method is to hatch the eggs on their sides. Whichever method you choose, both work well. Humidity should be around 60%. I do not add water once it hits this number, as the chicks will produce enough of a gas exchange to raise the humidity level. If you must increase the humidity, sponges work really well. If you are using a Styrofoam incubator, make sure all the vents are unplugged. Air Exchange and ventilation is very important during the hatching stage. There are myths that opening the incubator during the hatch, will cause the chicks to become weak and chilled, and chill the other eggs. Although excessive opening and closing of the incubator will delay a hatch and perhaps chill the birds, it is more important to make sure everything is working inside. In all honesty, the quail chicks should not be in the hatcher for more than 12 hours. 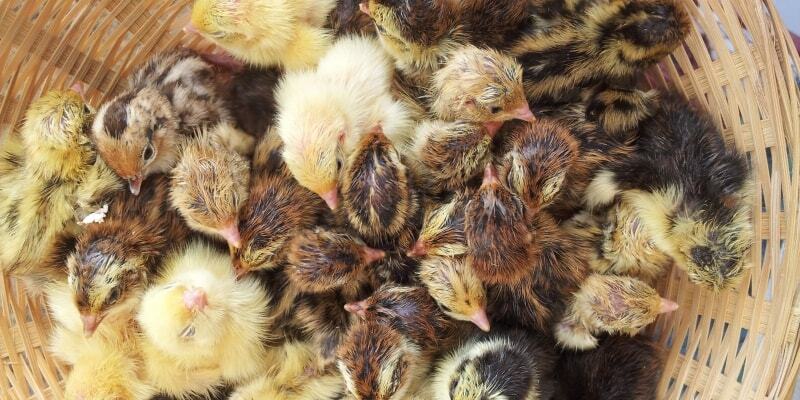 Once they are fluffy and dry, they should be moved to a brooder and given food and water. Compared to chickens, quail do not have the same reserves. They absorb their yolk much faster, being so small, and need nutrition after they hatch. They will be tired, like any new hatchling, but without water and food, they will not thrive. Many make the mistake of leaving the chicks in the hatcher for 24-48 hours, resulting in chicks not thriving and dropping out. What Do Quail Chicks Eat? Quail are precocial. This means that when they hatch, they are at a more advanced state than other “newborns.” They are mini adults, feathered, able to eat, drink, stand, and take care of themselves. They do depend on us for the food, water, and environment, however. If they were out in the wild, they would be foraging for their food and running around, relying on their mother for warmth when needed. An altricial bird in other species would rely on their mother for the first few weeks of their life, getting fed by mouth in a nest. This is a preference for the quail breeder. Most game bird feed rations are designed for game birds in general. 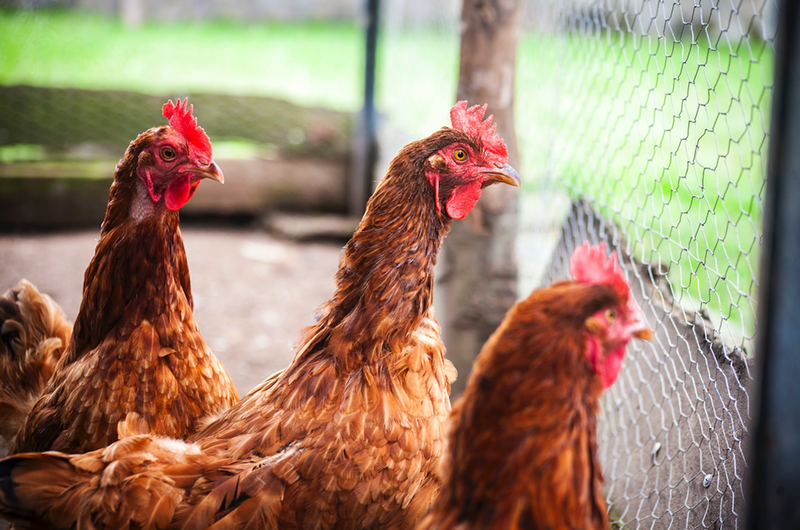 Some game birds are more prone to coccidia than others. Coturnix are very hardy birds and the added coccidiostat is unnecessary. Coturnix should go straight to the brooder when they are fluffy. The brooder consists of a warm area for them to grow in. We use fish tanks as our brooders, because they hold in heat very well and it is easy to raise and lower a lamp. There are many types of brooders out there for chicks, from cardboard boxes all the way to commercial brooders. Depending on where your brooder location is, the brooder needs to be away from drafts. There should be a lamp on one end of the brooder, preferable a 100 watt incandescent bulb. Make sure the lamp is zip tied or screwed to the wall or the lid to prevent fires and chicks from getting burned. What is needed for a brooder? -A container to hold the chicks in: This can be a fish tank, a commercial brooder, a Sterilite container, or a cardboard box. Make sure you have a lid. Having a thermometer in the brooder is a good idea. The brooder should start at the temperature of 95 degrees F and each week that temperature should go down by 5 degrees until the birds acclimate to room temperature. Always watch the bird’s behavior, regardless of what the temperature is, however. One way to tell if it is too hot or cold is the thermometer, however behavior is more accurate. If the chicks are away from the lamp or panting, they are too hot. If the chicks are huddled under the lamp, they are too cold, and both of these behaviors can lead to smothering and death. What you want to see is a nice equal spread of chicks throughout the brooder. This signifies they are comfortable. Lower or raise the lamp when needed by observing the chicks. Tip! Make sure your brooders have lids. Coturnix start flying at 2 weeks of age. They do not fly high, however they have bursts of flight. This is why it is important to lock down those lamps. Accidents can happen. Coturnix should be in the brooder for about 3-4 weeks, depending on how they are adjusting with the temperature. At 4 weeks of age, they can go on wire and in a grow out setting. In the grow out, no light is needed, unless the temperatures are lower than room temperature. The birds are not adults yet, therefore monitoring of behavior is needed to see if heat is necessary. Coturnix are considered adults at 6 weeks of age. During this time, they can be placed into an adult housing. Examples of housing are rabbit hutches, rabbit cages, aviary cages, or a commercial set up for breeding. Do understand that quail should never free range. They are a bit on the wild side, so if you let them lose, most likely they will leave or a predator gets a hold of them. Also understand that in some states, it is illegal to release your quail without a permit. Coturnix adults can be housed on wire or on ground. Feeding your Coturnix from day one is crucial. A good game bird starter of at least 28% is needed for their entire life. The more protein the better. Remember, these are fast growing birds and need all that boost to keep growing in the right track. How much does a Coturnix eat? Coturnix require 0.8 pounds of food per bird per day. This is equivalent to 50-60 grams per bird per day. Always read the labels on your feed bags for any additional requirements. Coturnix are fairly disease resistant, however they can contract diseases from wild birds and other fowl. It is best to house quail away from other fowl and keep the cages free from wild animals entering. It is observed that that most of the diseases seen in quail occur during the first 2 weeks of brooding. Hygiene is the key to prevent almost all the diseases that occur in quail. The cage or shed for housing quail should be clean. No other animals should enter the building. All the birds should be observed daily and those that exhibit symptoms, such as labored breathing, fatigue, and difficulty walking, should be removed from the flock and placed in quarantine. Feces should be observed daily for any discoloration. Knowing your flock is a great preventative. Worming and medicating your flock is almost unnecessary, however seek advice from a veterinarian if you suspect any changes to your quail’s health. The Veterinarian can aid in proper treatment. About the Author:Alexandra Douglas is the owner of Stellar Game Birds, Poultry, and Waterfowl. She specializes in Coturnix quail, however works on a diversified farm of quail, chicken, ducks, emus, and goats, and tilapia in Florida. She earned her BS in Animal Sciences from Oregon State University with an emphasis in Poultry Science and Pre-Veterinary Medicine. She has authored Coturnix Revolution: The Success in Keeping the Versatile Coturnix: Everything you Need to Know about the Japanese Quail.